As mentioned in my blog a few weeks ago, I have started seriously researching the differences between the iPhone 8 Plus and the Samsung Galaxy S9 to determine whether or not I should switch from the iPhone to Samsung. While I was happy with my iPhone 6 Plus, I recently began having battery issues with the device – even after Apple replaced the original battery, it needed to be recharged twice a day. Also, much to my disappointment, I accidentally cracked my iPhone screen by bumping into the kitchen table, which made it land on the tile floor. 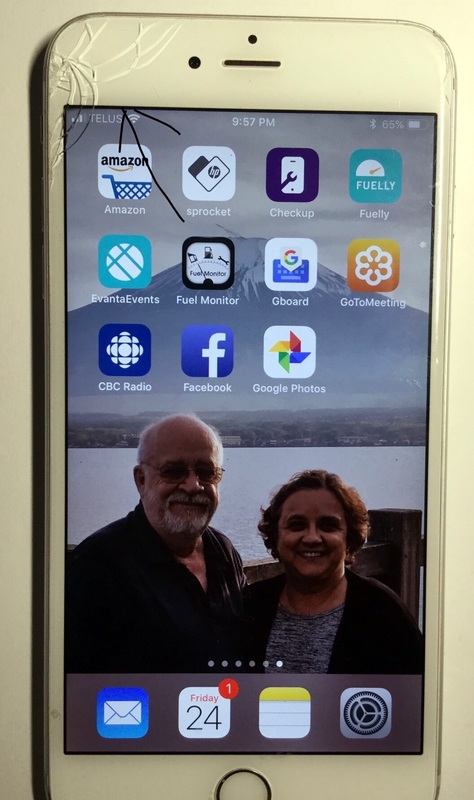 Luckily, everything seems to work, but having a screen cracked in the upper left corner has put pressure on me to purchase a new smartphone. The author’s current iPhone, crack and all. In my last blog I also described talking to both Samsung users and iPhone 8 users without gleaning very many advantages or disadvantages for either system. Both my sister and husband use Samsung smartphones and are very happy with them. One of my friends noted that if she’s having a problem with her Apple product she can get almost immediate assistance at the Apple store, while with Samsung you’re more on your own, though there is a 1-800 number you can call. I also concluded that my preference for Apple’s security overrode Samsung’s additional storage capacity, and I suspect it’s this line of thinking more than any other that led to me deciding to stay with the iPhone. My next step, then, has been to decide which iPhone model to purchase. I considered three options: staying with the iPhone 6 Plus, getting an iPhone 8 Plus, or getting an iPhone X. The major reasons I rejected continuing to use my old iPhone 6 was because of its lacklustre speed, my continuing issue with its battery, and its recently cracked screen. When I checked, the iPhone X cost $1529, compared to $1269 for the iPhone 8 Plus – about a $300 difference. Both have 256 GB storage. I was amazed how much iPhone costs have increased! You can buy a powerful laptop for the cost of an iPhone X. But as Apple CEO Tim Cook recently pointed out, the iPhone X has outsold every other Apple device in each week since it went on sale in November 2017, showing that price simply is not a big factor for iPhone users. 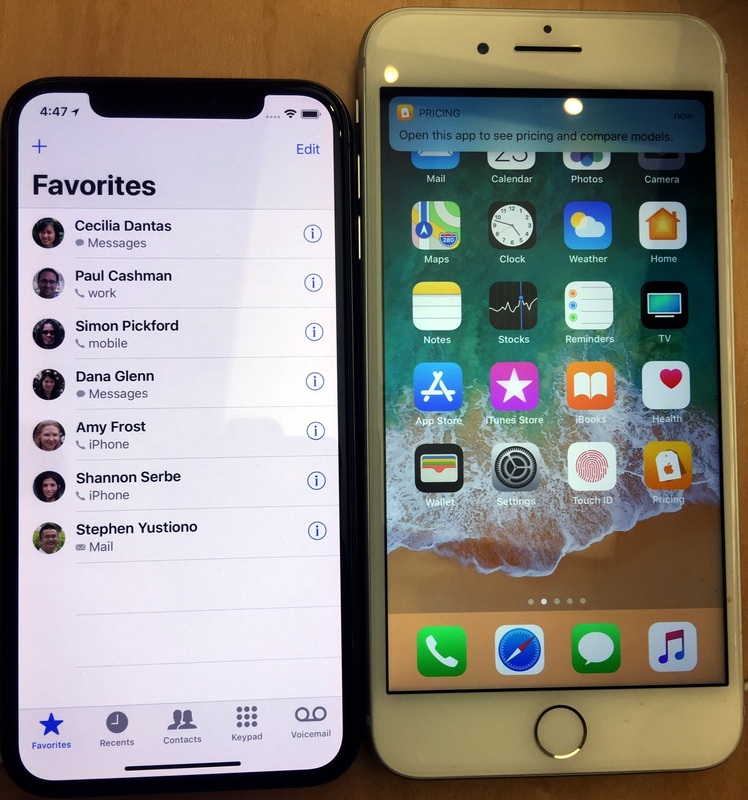 For that extra $300, you get facial recognition security (Face ID) rather than touch ID, a better camera, and a slightly larger iPhone screen size (the iPhone X is 14.7cm versus the iPhone 8 Plus’s 14 cm) – even though, as the picture shows, the iPhone X itself is smaller (70.9 mm by 143.6 mm) than the 8 Plus (78.1 mm by 158.4 mm). Nevertheless, unless I can get the iPhone X for cheaper than the list price, I’m opting for the iPhone 8 Plus. So, I’m now ready to go get my iPhone 8 Plus. But wait – it’s the end of August and the iPhone’s newest models are going to be announced soon, which means the existing models may go down in price. Should I buy or should I wait? (Potentially) Better still, should I wait for the (possibly) lower Black Friday prices? Would I be able to tolerate my slow iPhone 6 Plus with its battery issues and cracked screen until then? So many questions, so few answers! Stay tuned!